This is “Protein Digestion and Absorption”, section 6.3 from the book An Introduction to Nutrition (v. 1.0). For details on it (including licensing), click here. The egg: A good dietary source of protein. How do the proteins from foods, denatured or not, get processed into amino acids that cells can use to make new proteins? When you eat food the body’s digestive system breaks down the protein into the individual amino acids, which are absorbed and used by cells to build other proteins and a few other macromolecules, such as DNA. We discussed the process of food digestion in depth in Chapter 3 "Nutrition and the Human Body", but now let’s follow the specific path that proteins take down the gastrointestinal tract and into the circulatory system. Eggs are a good dietary source of protein and will be used as our example to describe the path of proteins in the processes of digestion and absorption. 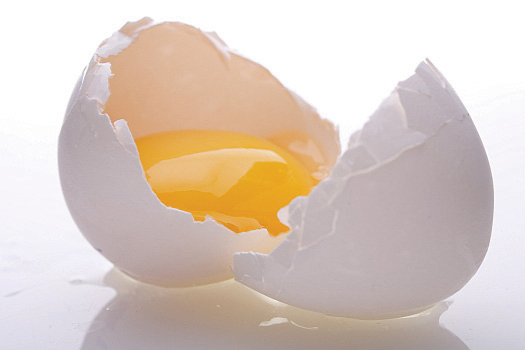 One egg, whether raw, hard-boiled, scrambled, or fried, supplies about six grams of protein. Unless you are eating it raw, the first step in egg digestion (or any other protein food) involves chewing. The teeth begin the mechanical breakdown of the large egg pieces into smaller pieces that can be swallowed. The salivary glands provide some saliva to aid swallowing and the passage of the partially mashed egg through the esophagus. The mashed egg pieces enter the stomach through the esophageal sphincter. The stomach releases gastric juices containing hydrochloric acidSecreted by stomach cells; aids in the chemical breakdown of proteins. and the enzyme, pepsinAn enzyme secreted by stomach cells. It breaks the peptide bonds between amino acids, producing much shorter protein fragments., which initiate the breakdown of the protein. The acidity of the stomach facilitates the unfolding of the proteins that still retain part of their three-dimensional structure after cooking and helps break down the protein aggregates formed during cooking. Pepsin, which is secreted by the cells that line the stomach, dismantles the protein chains into smaller and smaller fragments. Egg proteins are large globular molecules and their chemical breakdown requires time and mixing. The powerful mechanical stomach contractions churn the partially digested protein into a more uniform mixture, which, you may recall from Chapter 3 "Nutrition and the Human Body", is called chyme. Protein digestion in the stomach takes a longer time than carbohydrate digestion, but a shorter time than fat digestion. Eating a high-protein meal increases the amount of time required to sufficiently break down the meal in the stomach. Food remains in the stomach longer, making you feel full longer. Just as some plastics can be recycled to make new products, amino acids are recycled to make new proteins. All cells in the body continually break down proteins and build new ones, a process referred to as protein turnoverThe processes of continually breaking down proteins and building new ones.. Every day over 250 grams of protein in your body are dismantled and 250 grams of new protein are built. To form these new proteins, amino acids from food and those from protein destruction are placed into a “pool.” Though it is not a literal pool, when an amino acid is required to build another protein it can be acquired from the additional amino acids that exist within the body. Amino acids are used not only to build proteins, but also to build other biological molecules containing nitrogen, such as DNA and RNA, and to some extent to produce energy. It is critical to maintain amino acid levels within this cellular pool by consuming high-quality proteins in the diet, or the amino acids needed for building new proteins will be obtained by increasing protein destruction from other tissues within the body, especially muscle. This amino acid pool is less than one percent of total body-protein content. Thus, the body does not store protein as it does with carbohydrates (as glycogen in the muscles and liver) and lipids (as triglycerides in adipose tissue).